How hard can it really be to count otters? Frederick Kistner, from the University of Koblenz-Landau in Germany tells his story…. WildTrack’s mission is to develop and implement better techniques for monitoring endangered species. Specifically we’re interested in non-invasive and cost-effective approaches. Our footprint identification technique (FIT) is an example of the genre. Since we founded WildTrack in 2004 we’ve developed FIT algorithms for charismatic endangered species ranging from Polar bear to cheetah and Giant panda to mountain lion. We’ve worked with animals ranging in size from African elephant to European dormice, and our project partners now span 5 continents. 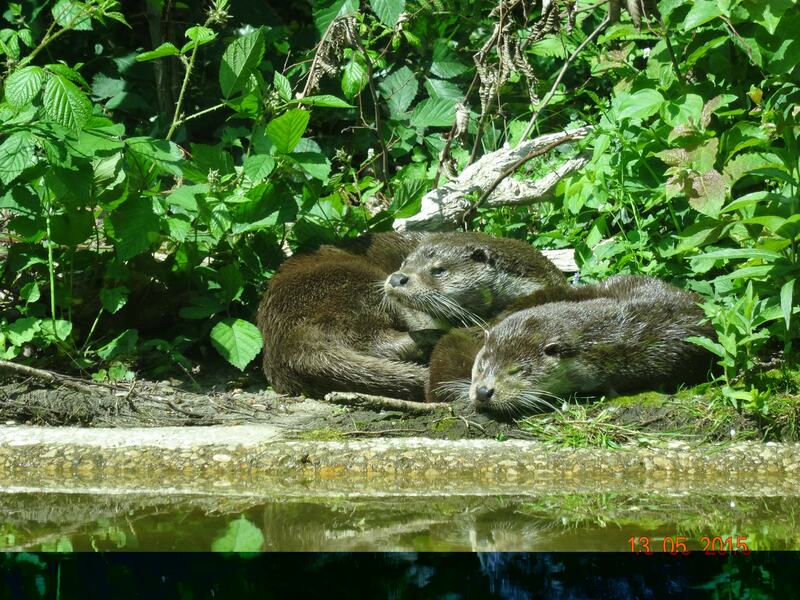 When the author of this blog, Frederick Kistner, approached us in 2014 to ask about the possibility of using FIT for a European river otter survey we thought it would be a pretty straightforward task. 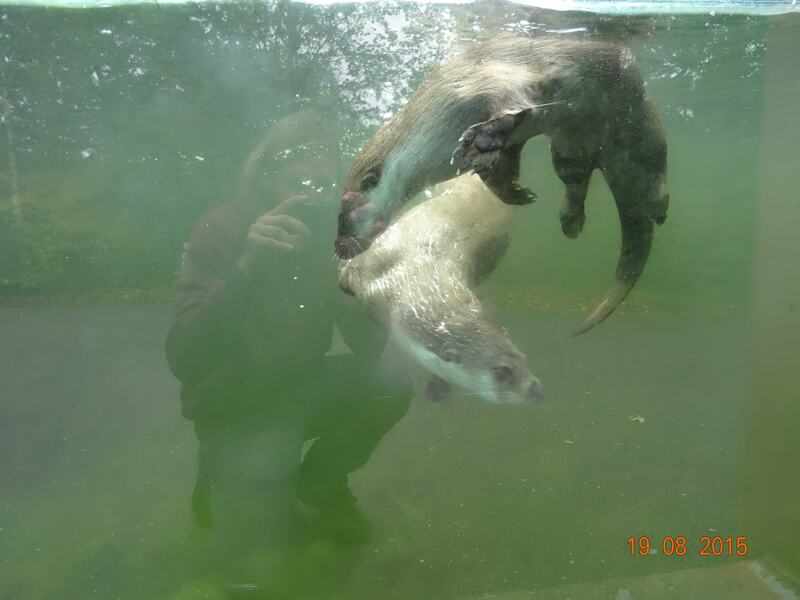 As it turned out the otters were about the most challenging animals we’ve worked with, as Freddy learned the hard way over a wet, cold winter in German zoos with slippery otters dodging his carefully laid sand trails. But Freddy was determined not to be out-smarted by his elusive subjects! He has collected more than a thousand otter prints for his training dataset and adapted our FIT script in JMP for his own needs. Not only that, but he’s now transferring the otter FIT technology to other otter researchers. Great work Freddy! The European fish otter (Lutra lutra) used to range over almost the whole of Europe. However, populations have declined dramatically during the last century. Though under the protection of the European Union Habitats Directive the fish otter is, sadly, now an endangered species in many European countries. However, there are hopeful signs. In several areas there is anecdotal information that otters are reoccupying areas where they were formerly listed as extinct. This is likely due to effective conservation strategies addressing the requirements for the designation of protected Natura 2000 areas. Having said this, it’s not easy to find out if otter populations are increasing or decreasing, yet this information is critical to the assessment of local conservation strategies. That´s when I found out that there is actually no easy and inexpensive method, since the otter is a nocturnal and generally shy animal. At that time I was still looking for a topic for my master’s thesis in environmental science and I was literally haunted by the question of how many otters were in the Aljezur river system. Axel Bamberger the head of Ceres told me that he knew Sky Alibhai and Zoe Jewell from Wildtrack and how they’d developed a footprint identification technique (FIT) that had worked for other animals. I thought this sounded like a great idea for my thesis and so we got in contact and decided to try to develop FIT for the otter. 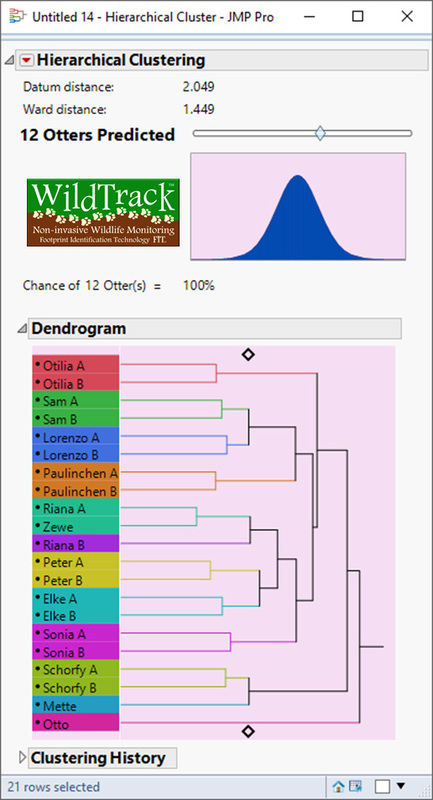 I knew that since FIT algorithms hadn’t yet been developed for otter, I had so start by collecting a reference database of footprints from known (captive) otters. 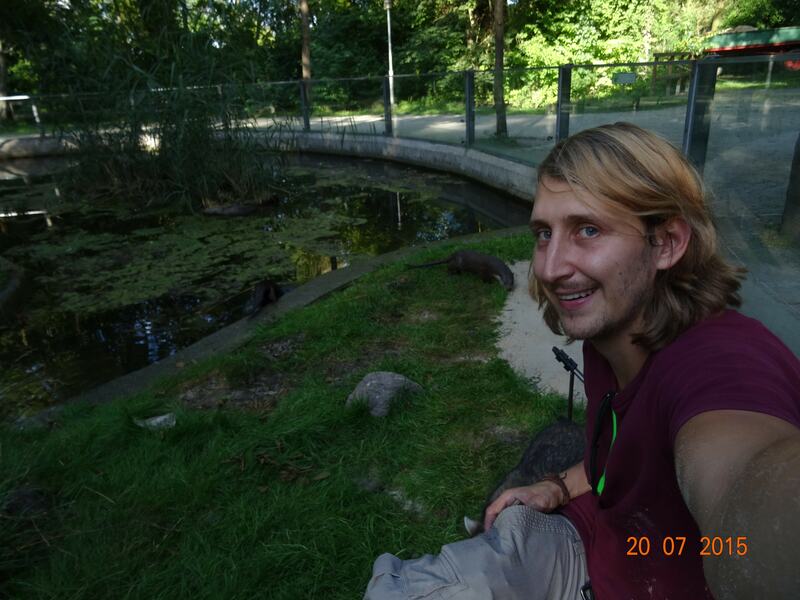 I visited several otter holding in institutions all over Germany and Austria in 2015. Naïve as I was in the beginning I thought I could easily visit one zoo per day! It turned out that the otters were not nearly as cooperative as the tigers of the Carolina Tiger Rescue Center shown to me by Sky and Zoe. My otters just did not want to even set foot on my sand installations so I had to leave the sand in their enclosures until they were used to it. So the proposed one zoo per day became more like one zoo per month since the weather was also an important parameter of getting good quality prints. Nevertheless I managed to collect over a thousand footprints of twelve animals. That´s where the next issue started. There was no description of how to distinguish between the four feet of an otter and the few reference drawings of the prints seemed to bear no resemblance to the prints I photographed!! I remember meeting with Sky and Zoe in Portugal to discuss how to separate the feet and where to set the digital measurements when one of them dropped the sentence “well from what you’ve described Freddy, and looking at the prints we have here, it seems that the otter is one of the most difficult species we ever worked with…”. At that moment I started to struggle whether it was a good Idea to take on such a challenge for my master’s thesis. Nevertheless I continued to work on it and eventually we came up with a very straightforward solution to distinguish between feet and prominent features. The way we selected the features enables us to also work with incomplete footprints since “perfect” prints only occur on about one third of all prints found in the field. This gives us the chance to work with a higher number of replicates that makes the statistics more robust. I learned to use the FIT add-in, in JMP data visualization software, and I’m currently working on the algorithm. The first results are more than promising. Models of the right front feet show accuracy rates of more than 90%. Since it is sometimes hard to find continuous trails of otters that have a high enough number of the same foot as necessary replicates I also developed a model that contains right front feet and mirrored left front feet. With this model I have currently success rates of more than 80%. These numbers are not final since there is still some testing to be done however they indicate that the European fish otter is another animal that can be individualized by using FIT. 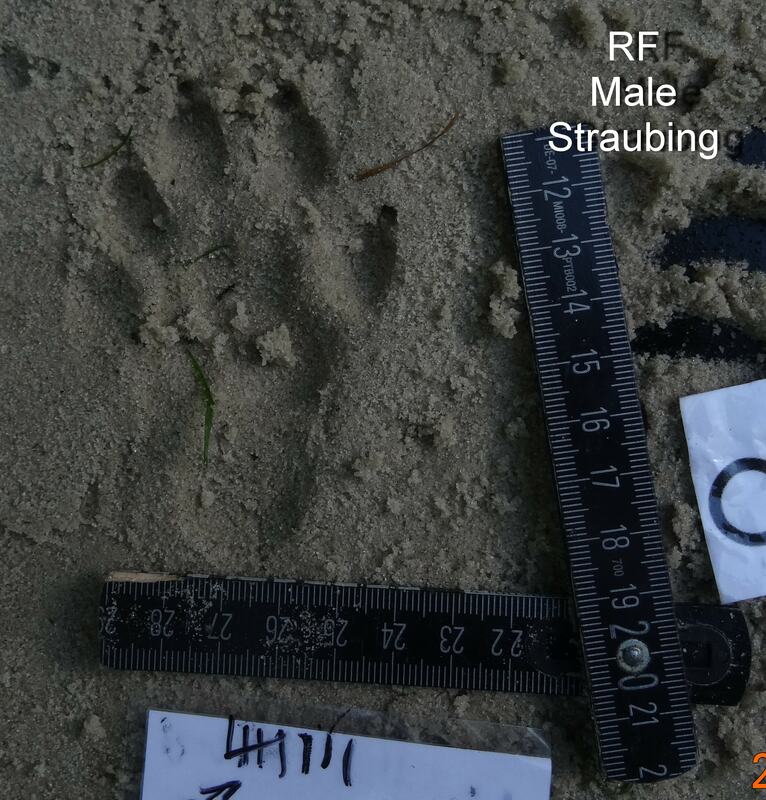 My next steps…..will be to collect footprints to provide estimates of the otter populations known to exist all along the west coast of Portugal. I’ll start by taking my European fish otter FIT model back to Aljezur and walk the rivers where I often see footprints, to conduct a complete census. In the meantime I have been contacted by a British otter researcher, Phillip Wiffing from the Suffolk coast otter project. Phil asked me if there was a non-invasive method he could use to conduct a census of his otters. I suggested FIT and taught him the techniques I used in the field in Portugal. His first attempts at footprint collection went really well. I’m hoping we’ll be able to compare his data from FIT with his other census methods using camera traps and volunteer observers. This will help us establish the robustness of the FIT method. Most of all I want my research to have a positive outcome for the owners of the footprints, so I’ll be presenting my data to the Portuguese Authorities to inform better conservation strategies and outcomes to protect these wonderful animals, who are such an important and beautiful part of European river and coastal ecosystems.